You are the most fierce creature I have ever seen. At school I wore my warrior house-paint tattoos. On a day I painted the lines extra thick, the new kid Eric sat next to me in English class. I liked his T-shirt, bow tie and acid-wash jeans pinned on the seams with cufflinks. He tapped his pencil, passed me a note. It said you are the most fierce creature I have ever seen. After school we stayed out late and watched the falcons swoop in the blue-black desert sky. I pointed to the one I knew would kill first. And when it did, Eric said teach me how to feel the world’s strings. HERE I STAND BY UTE CARSON, EVERY ROCK BAND BY JOE DE PATTA, A FALCON RIPS ORION FROM THE SKY BY ASHLEY INGUANTA, THE COURIER BY WILLIAM MASTERS, LEGACY BY JUDY L MANDEL. I was 15 when my band, piano, drums, and guitar, had our first paying gig at a school gym in the San Francisco bay area. It was terrifying and sensational. Performing has become easier decades later, but echoes of the original anxiety endure. The poems are about the competition, jealousy, frustration, friendship, loss, and joy that all bands experience. Whether they play note-perfect Beatles songs, ragged reggae, blues, prog rock, punk, or metal, every member has experienced the same disillusion and inspiration, sometimes in the space of a few minutes. I hold this story close to my heart. I wrote it for anyone who has been suddenly abandoned, anyone who has taken great emotional risks in order to find themselves. Right now I am healing from a huge, sudden abandonment in my life. And even though I have slowly learned how to mend this hole in my heart and spirit, I walk this world knowing that I am not the same—that I am more skittish, my stride not as smooth. I write to let others like me know that they are not alone. I hope this story gently holds your hand. I am also the author of three collections, The Way Home (Dancing Girl Press 2013), For The Woman Alone (Ampersand Books 2014), and Bomb, which is to be published by Ampersand Books this year. I am the Art Director of SmokeLong Quarterly , and my work has been published in The Rumpus and Bartleby Snopes . I write to nurture and nourish, and when I am not writing I explore this world with photography. My first writing life was that of a news reporter, which morphed into work in public relations and then corporate marketing. Sigh. My second writing life led me to write a memoir, Replacement Child (Seal Press, 2013), about growing up as a replacement of sorts for my sister who was killed in a plane crash, and about my family’s survival of that tragedy. Now, in addition to my own writing, I am an editor, writing coach, and ghostwriter. I run an annual Memoir Retreat Workshop, this year in Siena, Italy. My essays and articles have been published in The Southampton Review , Connecticut LIFE , ASJA Monthly , Complete Wellbeing Magazine , CAP Magazine , and other publications. As soon as I read John Cheever’s The Wapshot Chronicle, The Wapshot Scandal, and his short stories, I wanted to be a writer. The Courier is a story from an unpublished collection of 28 stories: Portraiture: A San Francisco Story Cycle. Here I Stand is based on true events. Maria is me. My most recent work is a chapbook Folding Washing and a collection of poems My Gift to Life. 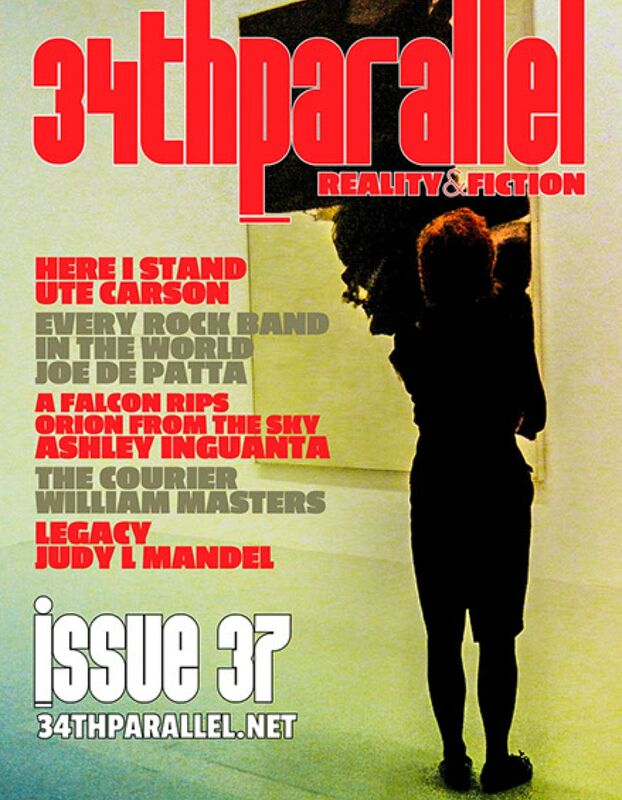 My story The Wife and the Piano Teacher is published in Issue 22 of the 34thParallel Magazine .